To celebrate gaining over a quarter of a million users for our MailShot apps, we are proud to announce a new update to version 3.2 of MailShot Pro and MailShot, bringing enhancements for iOS7 and a new Automatic Sort feature. To all those of you who have rated and reviewed the app, or spread the word to others about it. Thank you so much, we love you all, and if you find MailShot useful, we would really appreciate it if you could update your rating or review, so they can more easily be seen by people searching on the App Store. The title page, icon and graphics have now been updated for iOS7, bringing a fresh, clean look to the app. In the previous versions, email sent from the first person in a MailShot group might appear to have been sent from the group in iOS7 Mail. This is now solved in the update. After updating the app, just tap the “UPDATE” button on each group. 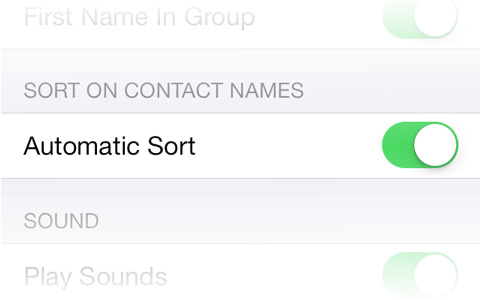 We have now added an Automatic Sort feature, which sorts your group whenever you add a contact. This feature is enabled on the “MailShot” page of the “Settings” app. We added this feature because we were surprised how many users contacted us after we moved the sort button in a previous update. Thanks again. As usual you can find help in the User Guide and on our Support Page, should you need any further assistance, please drop us a line from the ‘Support’ button in the app itself, as that will tell us a little about how your device is configured, which will enable us to help you more efficiently. We have just released an update for “FAQ“, our unique app that creates complete custom emails or text documents from your predefined text, in just a few clicks. The new update adds iPhone 5 and iOS6 support, and the ability to duplicate entire topics, text and images. We have also retitled the app to “FAQ – Email Composer”- to give a clearer impression of what it does. FAQ is great for customer support (and sees daily use here, answering user questions about our popular “MailShot” and “Shotlist” apps.) It is also fantastic for anything you may need to repeat often in email: such as instructions on how to reach your premises, boilerplate legal disclaimers, location details for grounds your team visits frequently, requests for donations, etc. It can really reduce the amount you need to use your device’s keyboard. If you find it useful, as always, please spread the word. A review on the App Store is always much appreciated, especially after an update. MailShot 2.0- Exchange, Android and More! MailShot and MailShot Pro 2.0 are now available on the App Store. These are the latest in a long line of free updates to be released for our unique group email app since its launch last year, adding useful features each time. Among other things, this update allows control over where your MailShot contacts are saved and introduces a new additional email format for compatibility with other platforms. Select which address book to save to. MailShot now saves its special group contacts to your default address book. 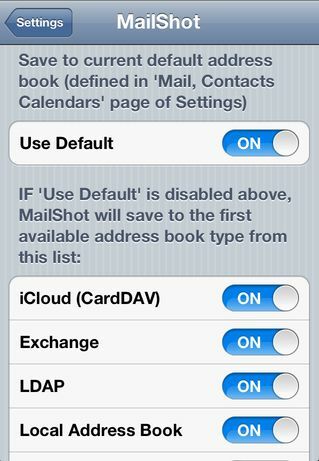 TIP: The default address book for your device is set on the “Mail, Contacts Calendars” page of the Settings app. If you need more control over where your contacts are saved, you can select which address book types to use. You can find more information on our support pages. You can now store MailShot contacts in address books that are synchronised with an Exchange server. This simplifies a few things that tripped new users up, and allows you to synchronise MailShot group contacts to Android, Google etc. You can use these group contacts to send email from Android devices, or from Google’s web mail. These extended features are provided as a convenience for our users, and your results may vary. Please do let us know if you encounter any problems or restrictions on use or group size when using this feature, so we can advise others. TIP See these links for tips on using Mac Mail, iCloud.com and the GMail iOS app for other workarounds to send email to MailShot groups. MailShot uses a special address format for compatibility with iOS Mail. You can now also create an additional, “standard” email address for the group contact. This is enabled on the MailShot page of the Settings app. This additional format will allow you to use MailShot groups in more places (but probably not Outlook, despite the name). Please let us know what does or doesn’t work for you. NOTE: Take care to choose the correct address when you have two of them available. iOS is always listed first. We now store the upgrade status for the free version of MailShot in iCloud. NOTE: Each group should still be managed from one device, and the contacts shared to your other devices. Just tap the contact in the list to edit its name or email address. As more people create iCloud accounts, ‘me.com‘ addresses are becoming more popular. We have added an additional warning pop-up when a group exceeds 200 contacts, as this is the limit per email from me.com. TIP: Any warnings that don’t apply to your email provider can be disabled on the MailShot page of the Settings app. We now ask for confirmation before a sort, as a number of users reported tapping the “sort” button when they didn’t intend to. Icon and title page graphics have been updated for the new iPad retina display. The minimum iOS version has been raised from 3.0 to 4.0. We estimate that fewer than 1% of our existing users are still using iOS 3.0-3.2. If you encounter any problems please let us know, as we are always very happy to help. Our Support page and User Guide are also always available for you whenever you need them. If you find MailShot useful, a new or refreshed review on the App Store is always very much appreciated (this is really important to us after an update, as old reviews get pushed to other pages.) The “rate” button on the title page of MailShot is provided to make this easier for you. Author Soluble AppsPosted on May 21, 2012 June 5, 2012 Categories App Store, iPad, iPhone, Press, Site Menu, SupportTags App Store, Email, exchange, Group, group email, iCloud, iPad, iPhone, list, send, Site Menu3 Comments on MailShot 2.0- Exchange, Android and More! Welcome to our first 10,000 MailShot Users. We have just heard from Apple that over 10,000 people are now using MailShot after its first few months on the App Store. We hope you are all finding the unique way you can send mail to groups from within your applications useful, especially with the new features we just added in our most recent update. You will find that it is an app you can continue to benefit from, month after month. We always love to hear from you. Please get in touch to tell us how you are using MailShot, to request features you’d like to see, or to ask for advice or help with a problem. We have just produced a comprehensive User Guide, so take a look if you haven’t seen it yet, you are bound to learn something. You can also still find advice and many answers to the most common user questions on our support page. It’s great to see how MailShot continues to grow, and we plan to continue to support it with updates in the future (we have updated five times already!). Much of our success so far has come from people spreading the word through social networks and forums and contributing reviews to the App Store. Many thanks go out to all those that have done this, it’s always appreciated. If you haven’t, please review us if you get the chance, as all the great reviews we have received so far are harder to find when we put out an update. Thanks again. We hope it won’t be too long before we are welcoming the next 10,000 users. Author Soluble AppsPosted on May 31, 2011 May 31, 2011 Categories App Store, iPad, iPhone, Site Menu, Soluble, Support, UncategorizedTags App Store, Apple, contacts, iPad, iPhone, Site MenuLeave a comment on Welcome to our first 10,000 MailShot Users. A new update has just been released for MailShot on the App Store which should bring greater mail server compatibility for many people. 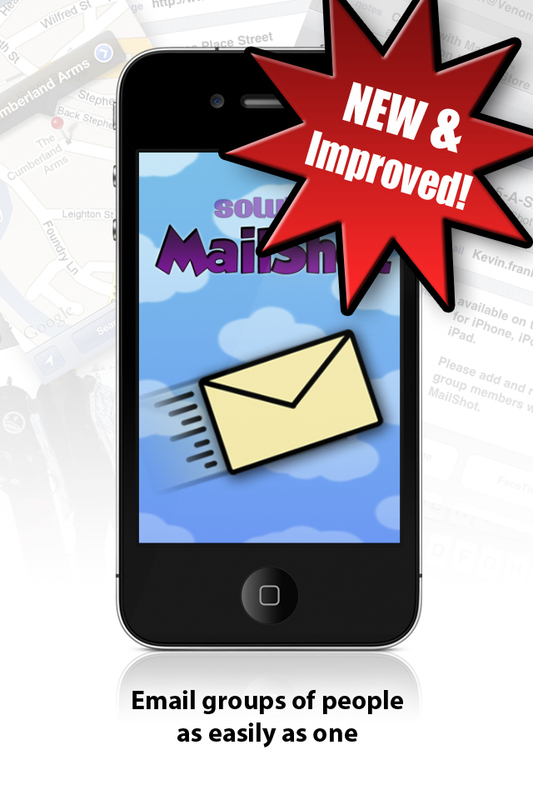 To find out more about MailShot please visit its page here. You may find the quickest way to find them all is to search for “MailShot” in the contact search bar. We delete the old contacts because we need to rewrite each contact group from MailShot to benefit from the update. to do this simply select each group in turn in MailShot and press UPDATE to rewrite it in your address book. You will notice some changes in appearance of the MailShot groups – the first person in the group will now show the group name (or a version of their email address if you send from Contacts) in the email header. This change was necessary to increase compatibility for different mail servers as your message travels around the internet. Generally we would now suggest that you should use Mail, or the many other apps that use its code, in preference to Contacts. MailShot has now been optimised for Mail because there are so many unique tricks you can do with it that you can’t do from Contacts, such as forwarding a mail direct to a group or using BCC to protect privacy. You may find Contacts still works for you, in which case fine. If this changeover causes you a problem compared to before, please drop us a line and we’ll consider adding a switch for “contacts-only” behavior in a future version. Another change is that the title screen now has buttons to reach this website for user support, and to make it easy tell people about the app by email or rating us on the App Store. If you enjoy MailShot please spread the word, but if you have a problem, please tell us and we’ll do our best to help. We have put lots of helpful information on our Support Page for you. MailShot version 1.1 is in test. The next version of MailShot is coming very soon. We cover the issue in more detail on our support pages, but if you should experience issues sending to your MailShot groups (such as server error messages, or certain people unable to “reply all”) on your system, please try using the Contacts app to send your group mail if you can, just as a temporary measure until the free update is available. Author Soluble AppsPosted on February 14, 2011 February 19, 2011 Categories App Store, iPad, iPhone, Site Menu, SupportLeave a comment on MailShot version 1.1 is in test. Now that MailShot is on the App Store we have been receiving the occasional support email. I am very pleased to say that we have been able to help everyone out so far. We added an illustrated walkthrough to our MailShot Support page today to help get people started, and a few more support questions and answers to the list, based on the questions asked in that first week. Do check it out, but don’t hesitate to get in touch if you still need help. Author Soluble AppsPosted on February 6, 2011 February 13, 2011 Categories App Store, Site Menu, Soluble, SupportTags App Store, Distribution List, Email, iPhone, Site Menu, Soluble, SupportLeave a comment on MailShot- Support page enhanced.